Caterpillar, Inc. (NYSE:CAT) was founded in 1925 and is headquartered in Peoria, IL. CAT manufactures construction and mining equipment, diesel and natural gas engines, industrial gas turbines and diesel-electric locomotives. It provides technology for construction, transportation, mining, forestry, energy, logistics, electronics, financing and electric power generation. I bought shares of CAT on two occasions, in August 2013 and in February 2015. After my initial purchase, the stock shot up nicely but in summer of 2014 things turned around. CAT slid all the way down to about $58 before turning around and launching somewhat of a recovery. This short article explains why I closed my CAT position. In my latest (1) DivGro Pulse article, I concluded that it was time to part ways with CAT. The stock has made a decent comeback even after experiencing a 15% drop in revenue. I rate the stock 4-stars and it is ranked #36 out of 49 stocks in my DivGro portfolio. I’m concerned about CAT’s near-term future (2), as revenue is expected to drop even further in 2017. Falling commodity prices in the farming, mining, and oil industries have caused deep cuts in equipment spending. CAT’s third-quarter results (3) were poor, with profits cut by nearly 50% and revenue down 16% from the year-ago quarter. Oberhelman will be replaced by a 35-year company veteran, Jim Umpleby, who will have to tackle the challenges the company will face in the near-term future. I made a net gain of 11.6% on the original amount invested, which is 4.7% annualized. 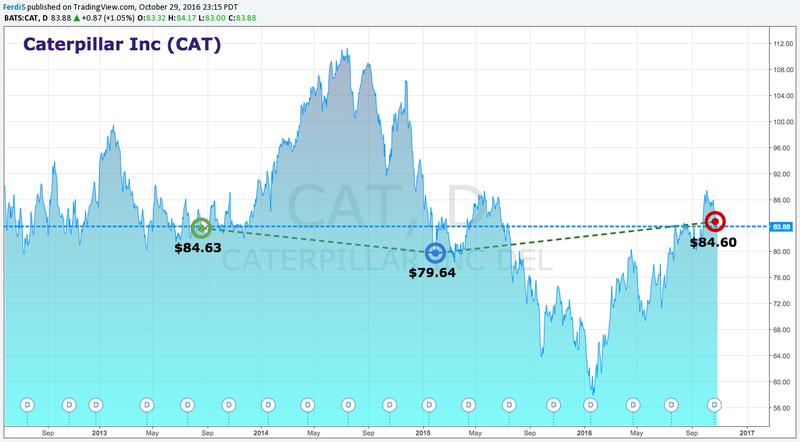 Closing my Caterpillar, Inc. (NYSE:CAT) position removed $184.80 from DivGro’s projected annual dividend income (PADI), which now totals $11,153. I still have some ways to go to reach my end-of-year goal of $12,000. Thanks for reading! Do you own CAT and, if so, are you going to hold onto your shares or sell them? Please let me know what you think in the comment section below. Note: FerdiS manages and writes about DivGro, his portfolio of dividend growth stocks created in January 2013. Please visit divgro.blogspot.com.